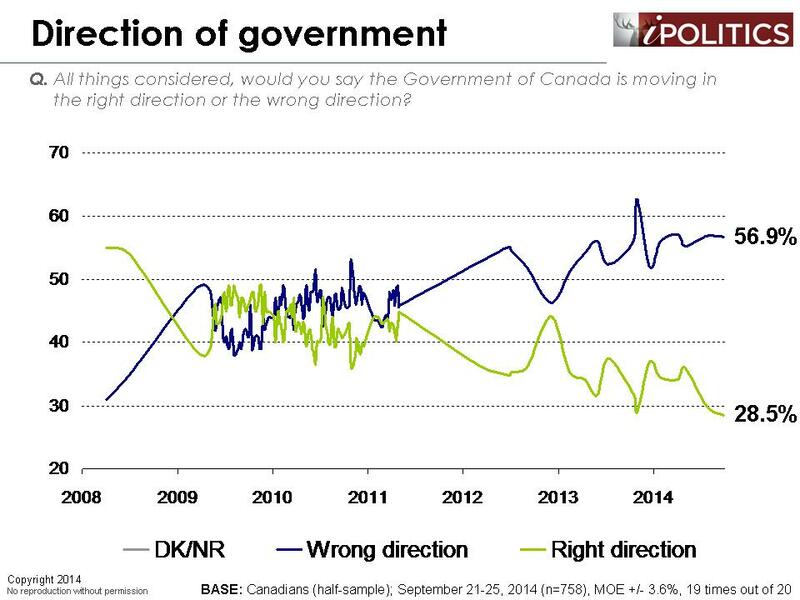 [Ottawa – October 1, 2014] In a major new survey of public attitudes and values, we find a pretty stable political landscape which is increasingly unreceptive to another Stephen Harper government. Not only would the government be in no position to aspire to repeat its 2011 success, it may not even achieve leader of the opposition with these numbers. While we find this scenario unlikely, the continued flagging of Conservative Party fortunes now renders this a real possibility. Indeed, Stephen Harper’s regal air coach may be about to turn into a pumpkin. Probing the underlying anatomy of support and related diagnostic measures suggest that things are indeed very grim for the current government’s future prospects. Pondering the time series above, a few points are obvious. Most notably, the Liberal ascension under Justin Trudeau is no mere blip; it is a long, slow march. Secondly, the Conservative decline is no ephemeral blip caused by some controversy or wobble. It is a steady and grim decline along a straight line of descent. If this were an ECG, the prognosis would be pretty bleak. 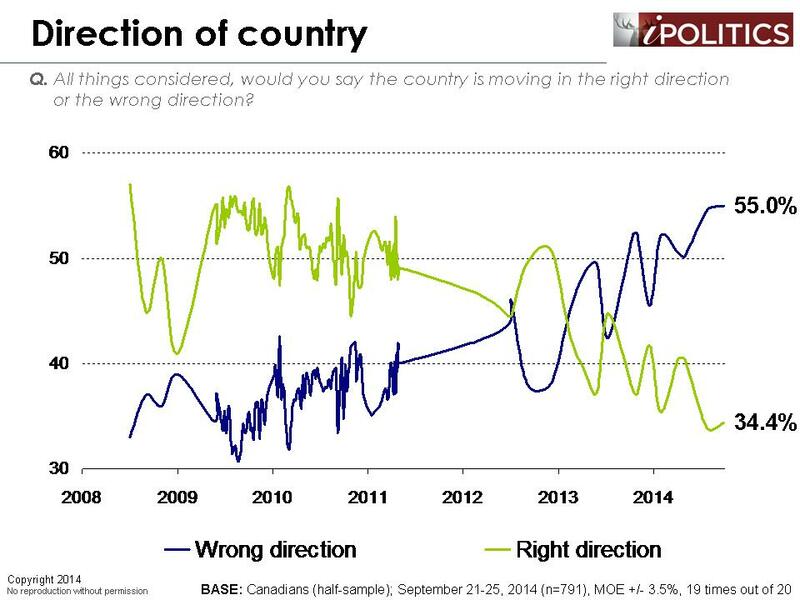 Turning to an important leading indicator – the question of whether we are moving in the right or wrong direction as a country – we see a modern record with 55 per cent saying wrong direction (roughly 62 per cent if we discount those with no opinion). In historical context, this indicator registered above the low 30s. Put another way, outside of the dwindling cadre of Conservative supporters, those who approve of national direction registers in the teens. The corresponding number for approval of federal direction is even lower. The problems of the Conservative Party are vividly arrayed when we look at the regional and demographic patterns. Outside of their fortress of Alberta, the Conservatives do not hold a significant lead in a single region or demographic category. Even their stranglehold on Alberta is dramatically relaxed and they have relinquished their longstanding ownership of the senior cohort. The Liberals, meanwhile, have strong leads in the Atlantic and Ontario and are competitive throughout the country. The NDP continue to lead in Quebec (albeit insignificantly) and have a new lead in British Columbia (which will bear watching to see if it holds). Things look even worse for the Conservatives when we turn to country of birth. The supposed “big shift” of new Canadians into the ranks of the Conservative Party has utterly collapsed. 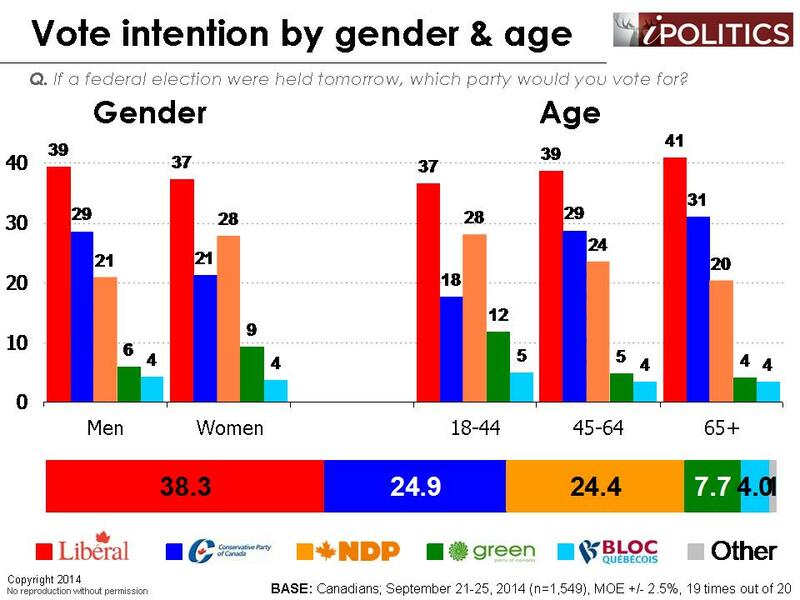 The Liberals now lead the Conservatives among this group by a margin of 47 to 21. Without some sort of fairly quick and profound turnaround, the chances of a fourth Harper government are looking increasingly remote. In this latest poll, we also updated our tracking on government vision, where we ask Canadians whether they would prefer a bold new government vision or a “steady-as-she-goes” approach. Canadians have traditionally been split on this issue, although it appears that the lean towards a bold new vision is somewhat stronger. While the public aren’t always certain which direction they would prefer, the Conservatives aren’t really seen as providing any vision at all. Over the last 16 years, the proportion of Canadians who are unable or unwilling to categorize the government’s vision has jumped from eight per cent to more than 40 per cent. Moreover, the Conservatives are increasingly not seen as even providing the more custodial steady-as-she-goes government that the voters saw in the past. The field dates for this survey are September 21-25, 2014. In total, 1,549 Canadians aged 18 and over responded to the survey. Of these cases, 1,401 were collected online, while 148 were collected by computer assisted telephone interviews (CATI). The margin of error associated with the total sample is +/-2.5 percentage points, 19 times out of 20. Canadians are finally waking up and we’re finally going to get rid of this vile regime once and for all. Third place for the CPC? Yes, I’ve seen this coming. Why not fourth? Even better! You used the patriarchal attitude “steady-as-she-goes.” Whatever happened to the pronoun “it”? Does “it” exist at all? Objects are not feme. What is wrong with “steady-as-it-goes”? Or does it FEEL good to objectify the feme? Isn’t it time for creative idioms and metaphors? author of Breaking the Patriarchal Code in which it is shown that 10,000 items of speech about our species embed male bias! Secondly, They do not have a long term plan for the country, everything is geared toward the next election and photo-ops. It is so tiresome and staged. This country was running very smoothly under the Liberals, with surpluses into the foreseeable future, now all we see are slashed programmes and services. CRA for example has been gutted with mailed in T1 returns either lost or taking up to 6 months to process. All so they can proclaim a forced budget surplus. Whole segments of the country have been hollowed out with whole regions forgotten at the expense of Alberta. Consumer debt, at an all time high, has been used to shore up “growth” and now we are seeing that flat-lining with full time jobs disappearing for part time jobs. It has all come home to roost. The arrogance and disdain that is shown the Canadian electorate has led to this decline and will continue to erode up to October 2015. I don’t recall seeing this pattern for a very long time, if ever. Usually there are more than blips on ascents/descents. This one looks more like two batteries: one charging and the other discharging. Finally some good news. We need the country to wake up before it’s too late. These polls represent the opportunity to save the future our forefathers worked so hard for us to have. Not some mean-spirited narrow interpretation of a world we fought so hard to escape. The future must be open to everyone with open hearts and minds. It’s somewhat reassuring that a majority of Canadian citizens (not Harper defined tax payers) are recognizing that the Emperio Harperio, is in fact “wearing no clothes”. However, Harper’s ability to manipulate events to his advantage has occurred before, and my fear is he’s going to install dramatic fear into people over the perceived imminence of direct attack by beheading women, children wives, mothers by evil men from ISIS in head dress wraps and portray himself as the “saviour Messiah”. It’s somewhat ironic that the original Greek / Egyptian goddess Isis was worshipped as the ideal mother and wife as well as the patroness of nature and magic. Now we’re being told that we’re to be at war against her antithesis. Politics has a perverse way of inverting reality. “Canadians are finally waking up and we’re finally going to get rid of this vile CPC regime once and for all”. Thanks Erik, I agree with you 100%! Excuse me, make that 300%. If Harper drops his promise of income splitting in favour of a personal income tax cut….if he reinstates the manditory long form census….if he allows federal scientists to speak of science….if he brings back gutted environmental scrutiny….if he promises to introduce more evidence based policy decisions instead of making up policy based evidence….if he promises more dialogue with the provinces….if he stops treating the 62% of voters who didn’t vote for him as people to ignore or insult….Then….maybe I’ll answer differently on the next poll. In the mean time, I like how this is looking. I hope to see Harper booted out in favor of a new Liberal government. 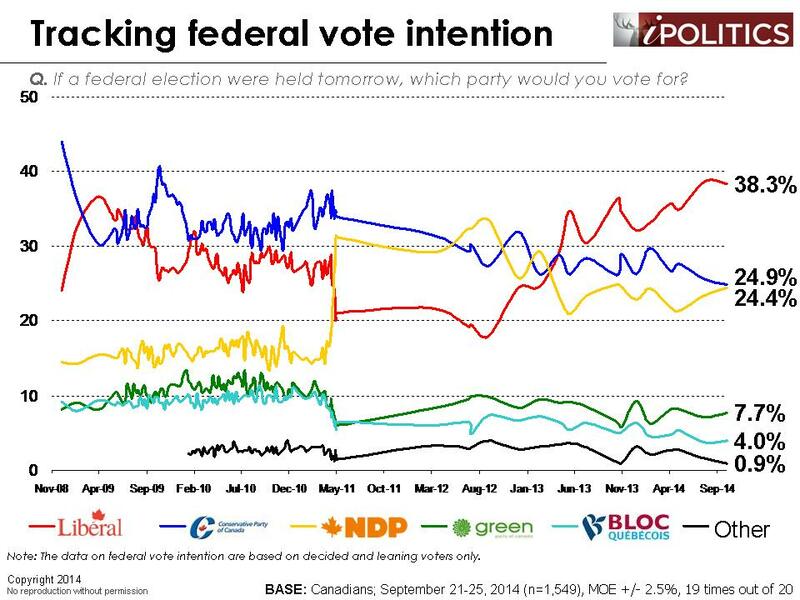 The news about this September 25 poll, however, is that there has been no significant change in the Ekos poll for the top three parties since July 23. In the cases of all three parties, there is less than a 1% change. WOOHOO!!! DOWN WITH THE HARPER AUTOCRACY!!!! VOTE THE CONS OUIT OF OFFICIAL PARRY STATUS COME 2015!!! WIPE THEM OFF THE FACE OF THE POLITICAL SPECTRUM!!! WOOHOO!!! DOWN WITH THE HARPER AUTOCRACY!!!! VOTE THE CONS OUT OF OFFICIAL PARTY STATUS COME 2015!!! WIPE THEM OFF THE FACE OF THE POLITICAL SPECTRUM!!! Great news all around ! As a socially progressive fiscally centrist 30-something first gen Canadian, this warms the cockles of my heart. 1. The loss of CPC support among 2nd Gen Canadians (often the best educated and very politically involved) is unlikely to be a blip. This trend will ensure CPC failing to win over the crucial 905 area suburbs (and likely much of greater Van too). 3. Many middle of the road folks “park” their vote with the Greens, at least in between elections. 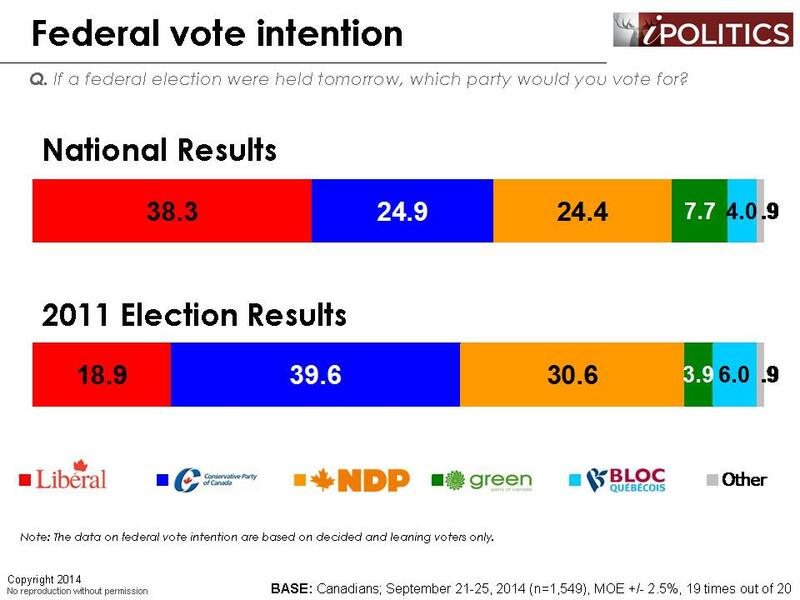 I have a hunch that many of the Ontario and Alberta “Greens” will turn to LPC/ NDP on election day. Keeping my fingers crossed ! The current extremist government has betrayed the Canadian electorate, and deserves to be utterly erased when the next election rolls around. Lies, damned lies and artful omissions are all we get from them. So long Steve, it’s been terrible knowing you. This poll demonstrates what I think will be the trend. The Tories will be Third in the next election. While the Liberals benefit from the drop of the Conservatives the NDP will too, perhaps in small proportions. There are many people that go between Blue and Orange in many places. 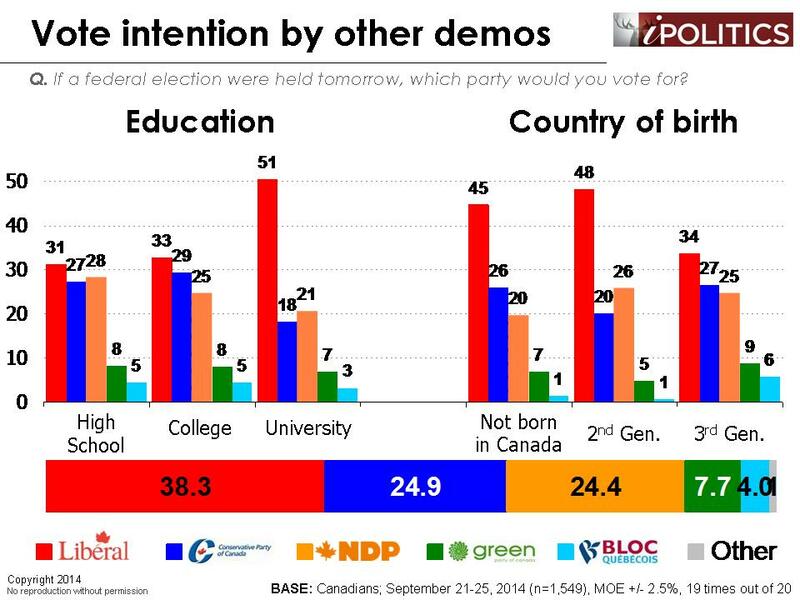 I also believe that Canadians are tired of the Liberals and when they see it is a choice between the NDP and Liberals and not the old Red and Blue door swing, they will move back to the NDP as choice. There is much up in the air at the moment but what I see as true, is that the Conservatives will form neither the Government nor, the Opposition. While a Liberal victory in 2015 will be a positive change for the country, do not expect much change on the fiscal front. The Liberals have made it clear they will not increase personal or corporate income tax so revenue will be at the same level as under Harper. With no new revenue sources the new government will be unable to reverse Harper’s cuts to services. I expect the new Liberal government predicted here will be all talk and no action. Sure, there will be fewer people going to jail and fewer wars, but our economy will continue to be stuck in a rut. A change of government will not be a magic bullet as long as we allow economic policy like CETA and super low corporate taxes to dominate government policy. We need a government that will reject the corporate agenda of the past couple of decades and spend money on infrastructure and a green economy. The biggest challenges this country faces are high unemployment, too many precarious jobs and climate change, and not federal government debt. I’m still waiting for the Liberals to put forward realistic policies to address these questions. The lofty aspirational message I’m hearing so far does not bode well for an improvement in Canada’s prospects. 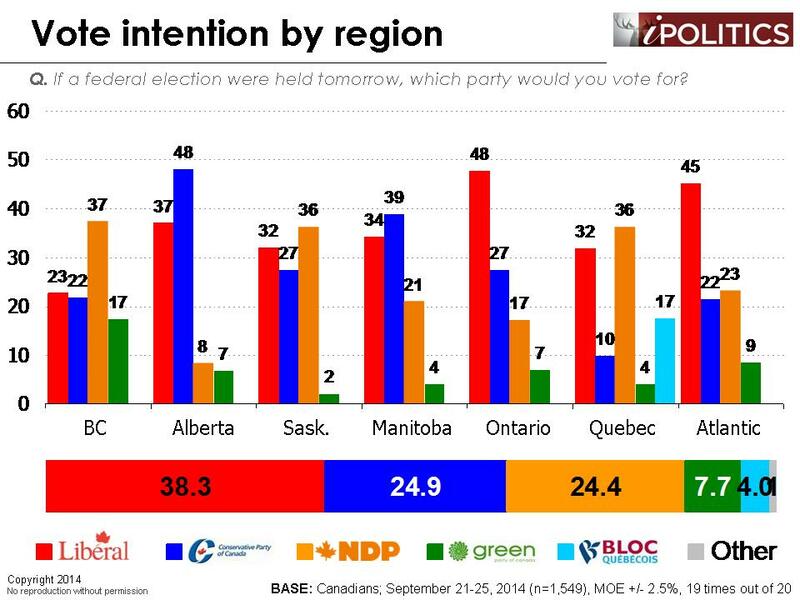 good results in bc and sask and Quebec. NDP if hold that lead in bc should increase the number of seats in BC and anything close to the numbers in Sask will mean NDP not shut out in Sk but will take a few seats. Quebec numbers if they hold , especially in francophone areas might mean NDP hold onto 40-45 seats. 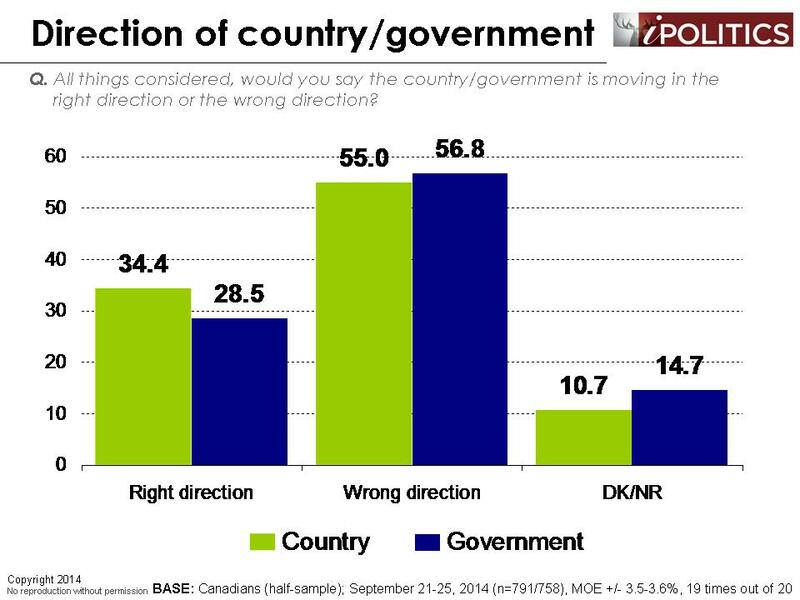 Ontario is disappointing as is Manitoba (4 term incumbent government sometimes translates to bad numbers federally). If Trudeau keeps saying silly things and the campaign and debate go well, still a chance when the voters contrast the leaders that Mulcair will be seen as the most respected and with experience the most ready to be Prime Minister. good chance that cons will be in third place next year-possible minority government. Harper will be throwing billions of dollars at voters in spring to help them change their minds. Mike Duffy will be on trial for fraud as a Conservative Senator and the 90k pay off by the PMO. original world class respectability. It has literally sickened me to see the erosion of our democratic system at home and our beguiling by other world leaders. The recent insult of Steven Harper squandering $300,000.00 of taxpayers dollars to buy Euro approval – although a drop in the bucket in comparison – is another example of just how out-of-control and unaccountable this Harper government is. So thanks for this, it gives me hope!